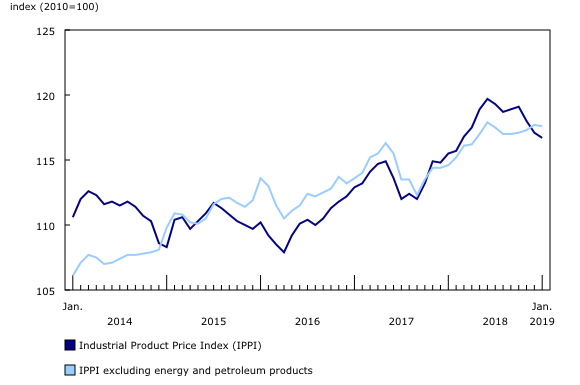 Prices for products sold by Canadian manufacturers, as measured by the Industrial Product Price Index (IPPI), declined 0.3% in January, driven primarily by lower prices for energy and petroleum products. 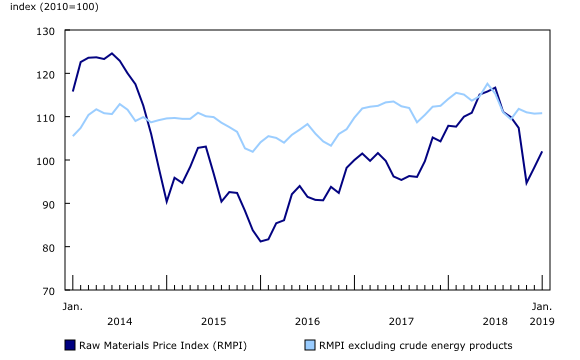 Prices for raw materials purchased by Canadian manufacturers, as measured by the Raw Materials Price Index (RMPI), rose 3.8%, mainly due to higher prices for crude energy products. The IPPI (-0.3%) was down for the third consecutive month in January, following a 0.8% decrease in December. Of the 21 major commodity groups, 12 were down, 8 were up and 1 was unchanged. Energy and petroleum products (-1.8%) were largely responsible for the decrease in the IPPI in January. This decline was mainly due to lower prices for motor gasoline (-2.2%) and lubricants and other petroleum refinery products (-4.3%). The prices of light fuel oils (-1.7%) and diesel fuel (-1.5%) also contributed to the decline in this commodity group. The IPPI excluding energy and petroleum products edged down 0.1%. Prices for chemicals and chemical products declined 1.0% following a 1.5% decrease in December. The downturn in this commodity group was mainly due to lower prices for petrochemicals (-8.7%). However, higher prices for other basic inorganic chemicals (+3.5%) partially offset this decline. Prices for pulp and paper products (-1.2%) also declined compared with December, mainly because of lower prices for wood pulp (-2.9%). Primary non-ferrous metal products declined 0.3%, primarily driven by lower prices for unwrought copper and copper alloys (-3.6%), unwrought aluminum and aluminum alloys (-3.2%), and other unwrought non-ferrous metals and non-ferrous metal alloys (-2.8%). However, this decline was moderated by higher prices for unwrought precious metals and precious metal alloys (+2.7%). Conversely, the decline in the IPPI was moderated primarily by higher prices for meat, fish, and dairy products (+1.0%). Growth in this commodity group was driven by prices for processed meat products, other meats and animal by-products (+2.1%), fresh and frozen pork (+1.2%) and fresh and frozen beef and veal (+1.1%). Some IPPI prices are reported in US dollars and converted to Canadian dollars using the average monthly exchange rate. Consequently, any change in the value of the Canadian dollar relative to the US dollar will affect the level of the index. From December to January, the Canadian dollar rose 1.0% relative to the US dollar. If the exchange rate had remained constant, the IPPI would have decreased 0.1% instead of 0.3%. The IPPI rose 1.0% over the 12-month period ending in January, following a 2.0% increase in December. Higher prices for motorized and recreational vehicles and primary ferrous metal products were moderated primarily by lower prices for energy and petroleum products. Prices for motorized and recreational vehicles (+3.8%), which have been up year over year since July 2018, contributed the most to the gain in the IPPI compared with January 2018. Prices for motor vehicle engines and motor vehicle parts (+5.5%), aircraft (+9.3%) and passenger cars and light trucks (+0.8%) were the main reason for this growth. Prices for primary ferrous metal products (+14.5%), particularly iron and steel basic shapes (+17.4%) and wire and other rolled and drawn steel products (+23.1%), also drove up the IPPI. Pulp and paper products were up 8.0% compared with January 2018, mainly because of higher prices for wood pulp (+8.9%), newsprint (+11.0%) and paper (except newsprint) (+7.1%). The growth in the IPPI compared with January 2018 was moderated primarily by lower prices for energy and petroleum products (-8.1%). Prices for motor gasoline (-15.2%) and, to a lesser extent, light fuel oils (-10.5%) and diesel fuel (-6.7%), were the main contributors to this decline. Year over year, prices for primary non-ferrous metal products (-4.7%) decreased for the sixth consecutive month in January. This decline was mainly attributable to lower prices for other unwrought non-ferrous metals and non-ferrous metal alloys (-13.6%), unwrought aluminum and aluminum alloys (-13.4%) and unwrought copper and copper alloys (-10.3%). The RMPI increased 3.8% in January, after posting an identical gain in December. Of the six major commodity groups, four were up and two were down. The growth in the RMPI was mainly attributable to higher prices for crude energy products (+8.7%), primarily conventional crude oil prices, which were up 8.8% after a 10.8% increase in December. The RMPI excluding crude energy products edged up 0.1%. Animals and animal products (+0.9%) also drove up the RMPI, mainly because of higher prices for hogs (+4.0%). The January growth in the RMPI was slightly moderated by lower prices for metal ores, concentrates and scrap (-0.7%). Compared with the same month in 2018, the RMPI declined 5.5% in January, after posting a 5.8% decrease in December. The decline in the RMPI compared with January 2018 was mainly driven by lower prices for crude energy products (-8.6%), especially conventional crude oil (-9.1%). The RMPI excluding crude energy products declined 2.9%. Prices for animals and animal products (-5.9%), particularly hogs (-17.5%) and cattle and calves (-11.5%), also contributed to the year-over-year decline in the RMPI, but to a lesser extent. Compared with the same month in 2018, prices for metal ores, concentrates and scrap (-4.4%) were down for the fourth consecutive month in January. Conversely, prices for crop products (+2.9%) rose compared with January 2018, mainly because of higher prices for oats (+20.4%) and grain corn (+12.3%). Real-time table 18-10-0248-01 will be updated on March 11. The industrial product and raw materials price indexes for February will be released on March 29.